Habit: Shrub, tree, unarmed; deciduous. Leaf: simple, alternate, cordate to reniform, +- leathery, glabrous. Inflorescence: umbel-like, axillary on short spur or +- sessile on woody branches. Flower: bilateral, generally appearing before leaves; sepals fused at base; petals pink-purple, banner inside wings in bud, keel petals free; stamens 10, generally included, free. Fruit: dehiscent, oblong, flat. Seed: 2--8. Habit: Shrub, tree < 7 m, glabrous. Leaf: < 10 cm; petiole 15--20 mm. Inflorescence: 2--5-flowered. Flower: keel 12--13 mm, > wings, banner. Fruit: 5--8 cm. Unabridged Note: Some authorities consider C. orbiculata Greene to be the correct name (see ICPN). 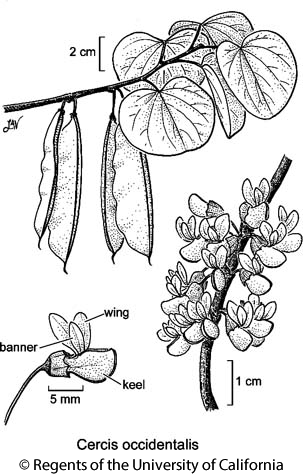 Citation for this treatment: Martin F. Wojciechowski & Elizabeth McClintock 2012, Cercis occidentalis, in Jepson Flora Project (eds.) Jepson eFlora, http://ucjeps.berkeley.edu/eflora/eflora_display.php?tid=18736, accessed on April 23, 2019. NW, CaR, SN, GV, SnFrB, SCoRO, SnGb, SnBr, PR, MP; Markers link to CCH specimen records. Yellow markers indicate records that may provide evidence for eFlora range revision or may have georeferencing or identification issues. Purple markers indicate specimens collected from a garden, greenhouse, or other non-wild location.